John William Cropper was born in Manchester on 17th November, 1897, and was baptised on 5th December, and is first recorded in our locality in the 1911 census when he was living as the “nephew” of James Cross, a pedlar, in Wrightson’s Yard, Stokesley. It seems that he was the son of William Cropper, a ‘coal heaver’, and Sarah Ann McGuirk who married on February 18th 1893 in Christ Church, Salford. Their respective fathers were recorded in the marriage registers as John Cropper, miller and Andrew McGuirk, poulterer. William and his parents were born in Liverpool and Sarah was born in Salford although her parents came from Ireland. There is a death recorded for a Sarah Ann Cropper, aged 39, in the December quarter of 1900 in Salford. Until very recently we were unaware of any further background to John Cropper's life, but thanks to Terry Cross of Guisborough, we can fill in some background. John William Cropper listed James Cross as his ‘foster father’ on his attestation form when he joined the army. This seemed difficult to understand. Given the fact that his father had a sister, and his mother had four brothers and two sisters, it seemed surprising that none of them took on the responsiblity for the young John William, particularly as two of the McGuirk siblings were his godparents. James Cross, the "foster father" was born in Norfolk and his family had moved to the North of England for work. Terry Cross is the grandson of James, and was able to give us valuable information on how the Manchester boy and the Norfolk man came to meet. There are no blood ties between the Cross family and that of John Cropper even though John is recorded as “nephew” in the 1911 census – the word ‘nephew’ is an addition after the initial completion of the form. Terry Cross tells us that John Cropper was taken on by his grandfather as the result of a chance encounter when the young John was being severely beaten by his father. James Cross intervened in the boy's defence and after a brief struggle, rescued him. The father apparently left, and James Cross found he had acquired responsibility for the boy! Terry further tells us that when the young John Cropper was about 14 years old, his natural father re-appeared to reclaim him, possibly because being old enough to work, the boy might be of some financial use. However, given the choice between his natural father and his protector, John chose to stay with James Cross, where he obviously felt happy and cared for. 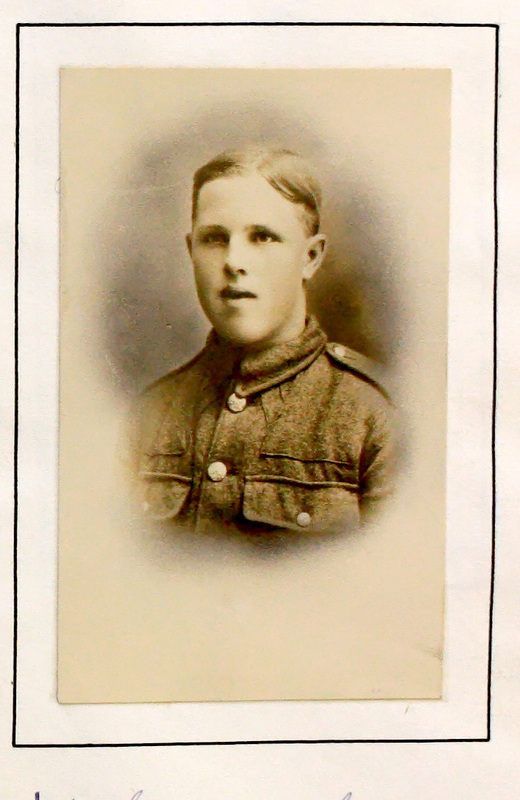 John William Cropper joined the army as a Private in the Yorkshire Regiment (Special Reserve) on 23rd January 1914. The Book of Remembrance reports that he was in the 3rd Battalion. His army records do not back up this statement, but they do tell us that he was born in Manchester and that he was still living with his foster father James Cross in Wrightson’s Yard Stokesley. He enlisted at the age of 17 years and 67 days, and was 5’ 4” in height, weighed 117 lbs and had a chest of 33½” (plus 2” expansion!). He had blue eyes, light brown hair and a fresh complexion, and a scar on his forehead which was half an inch long. At the time of enlistment he was working as a labourer in the brewery in Chapel Yard in the town. A reference was obtained from John’s employer, Mr Samuel Wiggins1 who said that he had known John for a year and had employed him for 6 months as a labeller and bottle washer. John had a good character but a short temper. He had not had a reference for him when he took him into his employ, and John had left his employ on 6th December 1913. John immediately began his recruitment training which lasted several months and included musketry training from 13th June – 12th July 1914. Private Cropper’s battalion was mobilised on 5th August 1914. According to the Book of Remembrance John was at Hartlepool when the bombardment by German battle cruisers took place in December 1914. The 6th Battalion was posted to the Mediterranean to take part in the Gallipoli campaign, sailing from Liverpool in July 1915. John's medal card records that he 'entered the war' on 26th October 1915. Perhaps this was when he was posted to the 6th Battalion of the Yorkshire Regiment. In any case, Allied forces were withdrawn from Gallipoli in November,1915, and Private Cropper was back in Egypt in December. The surviving men of the 6th Yorkshires were then posted to France in July 1916. This deployment was made in support of the Somme Offensive, in which British losses were truly horrendous, and John was transferred to the 9th Battalion Yorks and Lancs on 23rd September 1916 as his own battalion had been so severely depleted by casualties. According to the index card for his awards, Private Cropper was killed in action on 9th June 1917 but perhaps the accuracy of such a precise date is questionable. At the time his battalion was involved in the Battle of Messines Ridge, which began on 7th June. British troops were moved into No Man’s Land at 1.00 a.m. on that morning and ordered to lie flat on the ground. This was because 19 mines had been laid under the opposing German positions by British tunnellers. At 3.10 am about 450,000 kilos of explosives were detonated simultaneously under the German front line. The effect was to create a man-made earthquake which killed the enemy front line soldiers instantaneously and sent surviving German soldiers in the rear trenches into a panic. The explosion was so loud that it was heard in the South East of England. John Cropper was amongst the soldiers who were to deliver the follow-up infantry attack. He was in the 23rd Division which together with the 47th Division formed the left defensive flank of the attack and was tasked with advancing on to the ridge around the Ypres-Commines Canal and railway. The 47th Division had orders to capture a spoil heap north of the canal to eliminate a number of German machine gun nests dug into it, whilst the 23rd maintained the defensive flank advancing 300 yards in 20 minutes. The spoil heap (known as Hill 60) was an artificially created hill, 250 metres long made from the spoil from a railway cutting; on the other side of the cutting was another spoil heap, known as “caterpillar”. The rest of the German front line was practically wiped out by the exploding mines and one of the only significant points of resistance along the length of their front line was the spoil heap. Even after they had been mined, the German defenders hung on grimly on the spoilbank, from which their flanking machine gun fire took a heavy toll on the 23rd Division as it attempted to clear a nearby forested area known as Battle Wood. It was not until the afternoon that the enemy was able to mount a counter attack. By then, many British and Anzac troops had occupied the top of the ridge, from which they poured fire into the German attackers, repulsing them with heavy losses. At 15.10 the allied barrage opened again. The German machine gunners on Hill 60 continued doggedly to hang on, continuing their deadly work against X corps, among whose men was Private Cropper. Despite the advantage they gained from the initial detonation of the mines, the allies faced a further 6 days of fierce fighting in this locality. Private Cropper’s posting as ‘Missing, presumed dead’ would have been made following the roll call which revealed his absence. The exact date and location where he died cannot be known with certainty. John William Cropper was only 19 years old when he fell. He was awarded the British War Medal, the Victory Medal and the 1915 Star. He has no known grave but is commemorated on the Menin Gate Memorial, Ypres, on Panels 36 and 55. Go to next soldier: Denman P.D. 2. James Cross senior died in 1937. However, he also had a natural son (also called James Cross), who was Terry's father. Terry tells us that in the tough days of the 1930s, the young James enlisted in the Green Howards at Stokesley Show! He became a good boxer and represented the Battalion. He left the army in 1937, but rejoined as soon as the Second World War began. In later years, James was well remembered in Stokesley for taking good care of his mother. We are very grateful to Terry for his contribution to our knowledge, and we are certain that he can feel rightly proud of his father and grandfather.